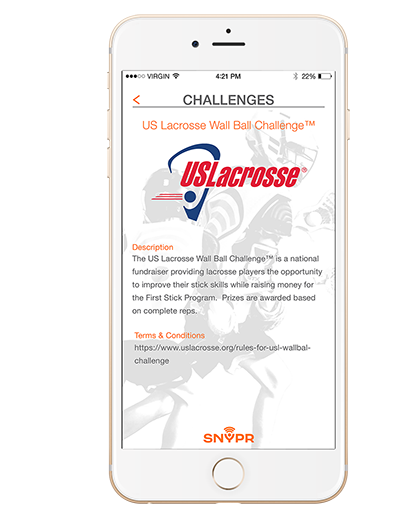 The SNYPR app is geared towards players and coaches who want to track wall ball reps, progress, and rank among other players regionally and worldwide. Version 2.3.1 brings Team Challenges and the ability to join Multiple Teams. All you need is your smartphone and a way to attach it to your arm and you are ready to hit the wall. Whether you're just competing against yourself or want to see where you rank against others, the SNYPR app has got you covered. Password login: Players are now able to log in using their username and password. 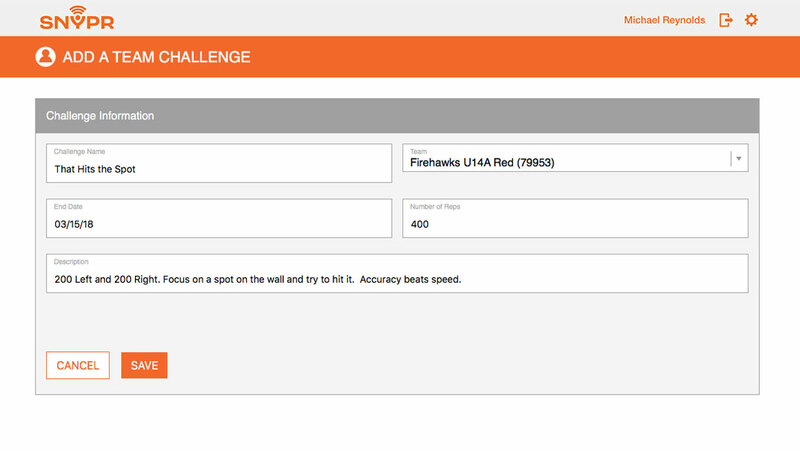 This allows a player to log into different devices to count their lacrosse reps. If a player loses their phone or gets a new one, or a parent wants to loan their phone to their child, this new password feature allows that to happen, while preserving their account profile and reps.
1. Download the free SNYPR app. If you are on a team, enter the Team Code that you will get from your coach. 2. Attach your smart phone to your right arm. Press the Play button on your app, and hit the wall! You can even listen to your favorite music at the same time! Watch out for our special events when your hard work can win you a cool prize! 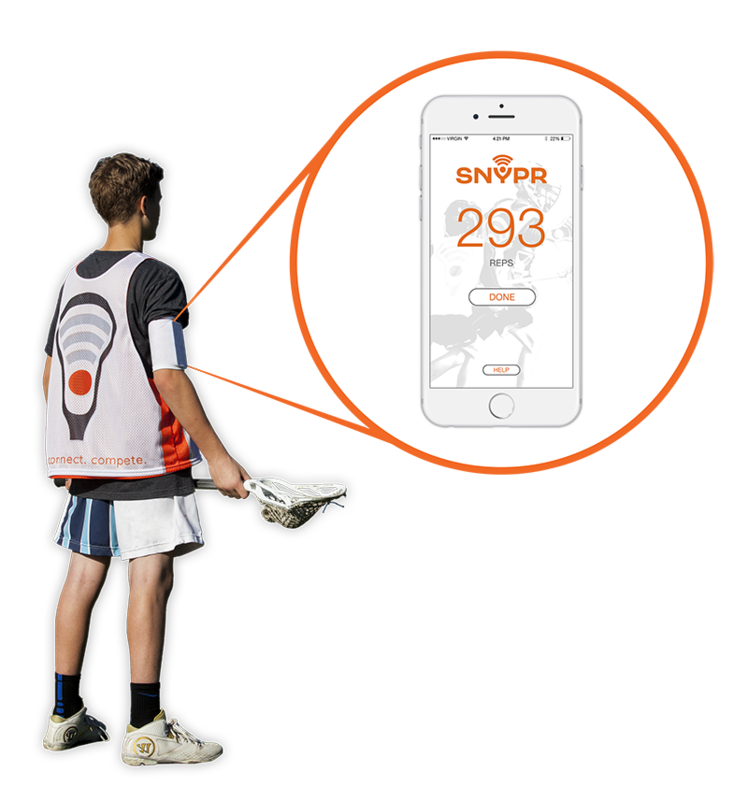 The SNYPR app is powered by our proprietary motion algorithms and sensors in your phone, which when strapped to your upper right arm with a compression sleeve can automatically detect both right and left-handed lacrosse throws. See how you stack up against other players with daily, weekly and all-time leaderboards. You will be able to see how your compare to other on up to 3 different SNYPR teams, as well as others in our region and from around the word! 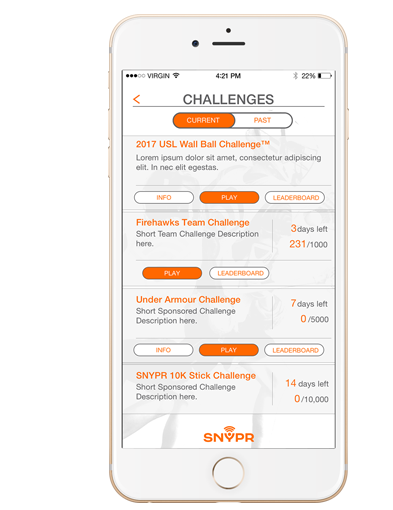 With the SNYPR app, you can track your weekly wall ball activity and your overall reps history under the STATS button. You'll know when your routine is consistent, and also when you've been slacking and need to hit the wall! 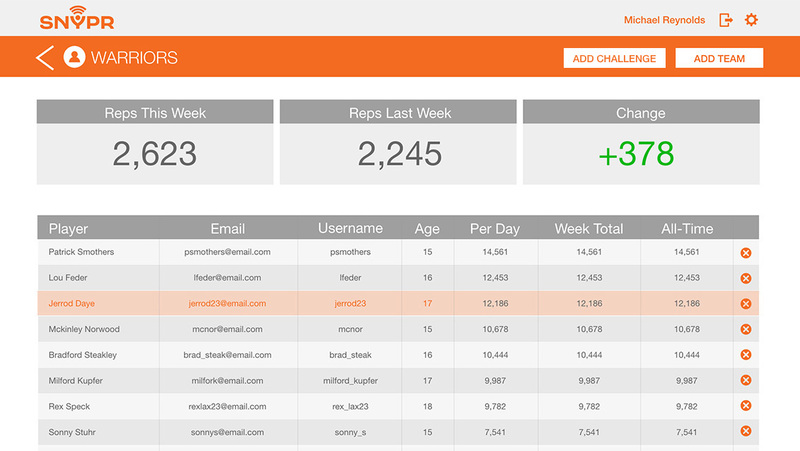 The Progress Chart shows a 7-day view, and the Reps History shows a scrollable list of your last 30 active dates with at least one rep.
Our new Challenges feature allows players to compete against other players on their team, in their region and around the world on team and sponsored challenges. Team Challenges are created by a team's coach, and players compete on private leaderboards. Sponsored challenges include charity fundraisers, such as a US Wall Ball Challenge. Through our partnership with RallyMe we can power a fundraiser for your local club or charity. 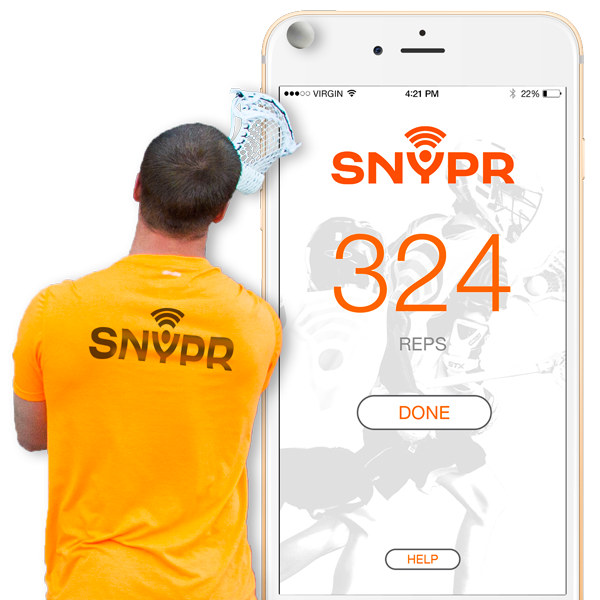 The SNYPR coach function allows you to create your own SNYPR team, send rep challenges to your team and track your players’ reps on a private leaderboard. Motivate your players to play more wall ball and work on individual skills. 1. Create a free Coach Account on SNYPR.com, and add a team. Each team added to your account will have a unique 5-digit Team Code that you will share with your players. 2. 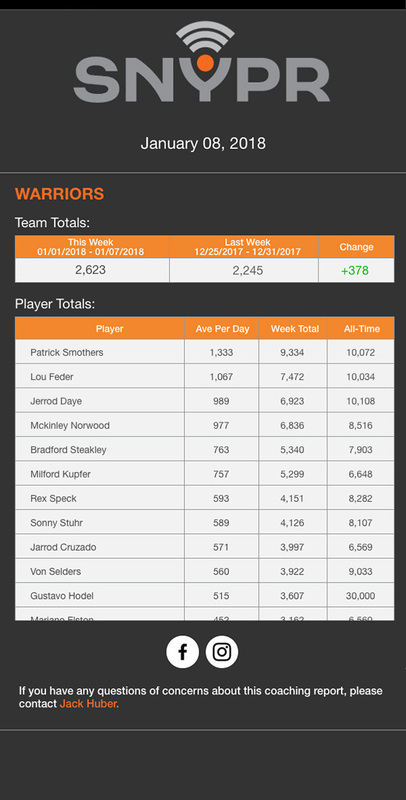 Players download the free SNYPR app and can join your SNYPR Team by entering the Team Code either during initial sign-up, directly from the TEAM leaderboard screen or from the Settings menu on the STATS screen. Team/Coach Questions? Please email us at Support, and talk to a coach and team expert. The SNYPR Coach Account allows you to see all of your teams in one place and easily manage all associated teams and rosters. Create an account, and add teams easily and intuitively. The SNYPR Coach Account also allows coaches to send team challenges to their players. With the SNYPR coach/team feature comes weekly SNYPR Team Activity Reports. An automated weekly email report is sent to up to three coaches associated with the team. Don't have time to log in? SNYPR brings the progress of your players right to your inbox.